50 episodes!!! Woohoo! When I started doing this podcast, I didn’t really know where it would go or even what my vision was. But at the same time, I saw it as something valuable for my clients and myself. It’s a great way for me to seek out truth and be an active learner so I can be a better father! Thank you so much for listening to my podcasts! It has truly been a labor of love! 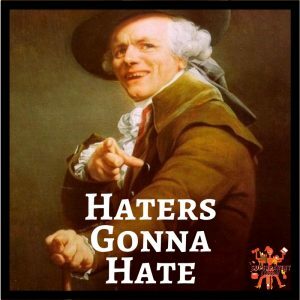 One thing in this journey, I have encountered my fair share of haters! It’s funny because many people are so quick to judge just because of what I’ve gone through. I’m a divorced man who has a child from that marriage. I’m a blended family man and a CHIROPRACTOR! There are some people out there who will say they don’t believe in chiropractic. Say whatever you want about that, but I can say I’m still here! What does it mean if you have haters? It means that you stood up for something. There will be people who love you for it, and others who hate you. There are even people out there who hate Jesus! If you’re a Christian, you probably love the man! Even if you are Muslim, Hindu, agnostic or atheist, you might still respect the man and Christians’ beliefs of Him. But there are those who are out there that hate Him! He was crucified! Obviously, he had a huge mob of haters. I was talking to a wonderful person close to me. She was feeling very discouraged about her business because of what some of the haters or trolls were spreading. They had an opinion and wanted to share it, and it’s not personal. Even if it is personal, they’re just doing it for fun or gossip. That’s what a troll is, someone who is causing mischief or trouble, just for some sort of sick pleasure. The only way you won’t have haters, is if you don’t stand up for anything and continue to play small. If you’re not trying to make a change in or life or this world, you’re not going to have haters. If you don’t have any haters, then you’re not using your full potential. You’re not obligated to listen to haters and trolls or let them influence your life! You can choose to use some of the criticism to see if there is any way you can improve, if you want. However, take it with a grain of salt! You’re free to block or delete them to silence them in any way you see fit. Here’s the takeaway. Everyone has haters. You don’t have to tolerate them. Go to Youtube and watch “Celebrities Read Mean Tweets.” It just brings to light how ridiculous people can be! Take heart and have confidence in your passion and in your message. Call to Action: Two things! One: Take 15 minutes to delete, unfollow or block unhealthy people and trolls from your timeline. Two: Get clear on what your purpose or passion is. Identify it and own it! Take heart and have confidence in your passion and in your message. 051 – Stop Eating That!